Ian Williams, carefully returning BJ4033 back to standard specification, was interested to see some of Chris Gould’s archive images: “the dark green car belonged to a friend Graeme Banks. The yellow car is a 65 that belongs to another friend; this has had the tail section moulded and replaced in fibreglass, with a tuned touring engine. Bob Simms’ white car Nippy 7 is currently in bits for an impending restoration. GL646 has a Big Seven front axle which was a common NZ modification in the past as we had (still have in places) some very rough roads; the Big 7 axle has much stronger kingpins and stood up to the abuse better”. 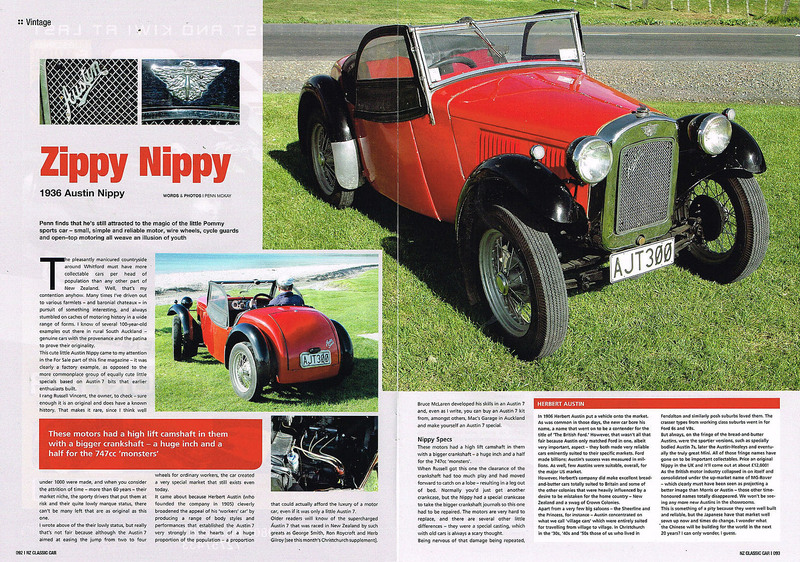 So that’s 10 cars below – can anyone identify any more Nippys in New Zealand?